Need a new recipe for your family potluck party? Believe it or not, this is a jello shot! There’s always room for jello, especially in a cocktail setting. 2 sisters have created an art out of these once only-acceptable-in-college party snacks. I’m obsessed! 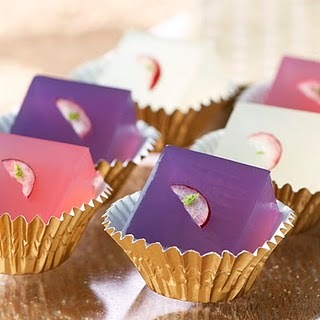 I made the Blackberry Cosmo Martini Jelly Shots this weekend for friends, and they were a huge hit! 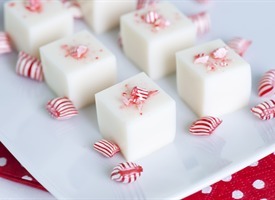 I will be making these Candy Cane Martini Jelly Shots this weekend for my family. My aunts will enjoy the throwback, sans the messy fingers. I refrigerated overnight in a bread pan and cubed them to look like the above photo. They were perfectly gelled, even after sitting out for an hour or 2 while my guests were devouring. The recipe says it will make 24 shots, but I got almost 60 from a single batch and they were 2-bite size. All the ingredients are very inexpensive (under $3 each with the exception of the alcohol. If you’re really on a budget, make them virgin!) but your guests won’t even realize because they will be too busy appreciating your efforts! And isn’t it really the effort that counts here? I hope everyone has a very happy holiday weekend and if you’re having guests, show off your home with all the deceivingly inexpensive tricks you have learned! Merry Christmas! I’ll be back next week!